Subiaco at Santuario del Sacro Speco - St. Benedict's monastery in the mountains. 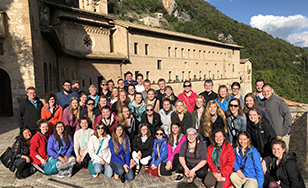 Members of St. Scholastica's Concert Choir and Bella Voce choir visited Italy in May for a performance tour that combined music with Catholic Benedictine heritage. The trip lasted from May 14 - 25 and included historical highlights along with performances. The 50 singers, along with choir conductors Bret Amundson and Sarah Ludwig, sang for Mass at St. Peter's Basilica in the Vatican. In total, they sang six concerts/Masses. The tour itinerary included a visit to Sacro Speco, the holy cave where St. Benedict lived before organizing his first monastic community in the sixth century. His Rule of St. Benedict provided the foundation for Catholic Benedictines, and his twin sister, St. Scholastica, is the College's namesake. The group also visited Subiaco, which is home to St. Scholastica's Abbey, a Benedictine monastery built into the side of a cliff. Here is a photo album of some highlights from the tour. In addition, the trip included some tourist attractions, including the Vatican Museums, the Sistine Chapel, the Roman Forum, the Colosseum, the scenic Amalfi Coast, and the city of Pompeii.